This week I'm honored to introduce you to incredible artist, Lisa Bohnwagner. 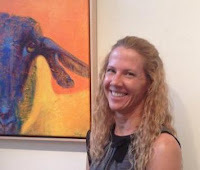 Lisa paints with acrylic using bold color, usually on boards and canvases that she has texturized with various mediums. 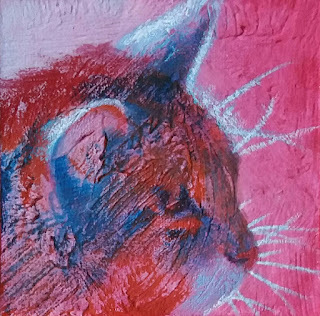 Lisa's animal portraits are unique as she captures animals in unexpected colors that give them a new perspective. She is able to capture their souls through their eyes while conveying personality with color. Be sure to visit her social media sites that are listed at the end of the article to see her beautiful artwork. She accepted my invitation to contribute an article to my Back to Basics series with this post on "Which White is Right". ﻿I began using acrylics in 2008, but until a few years ago I thought Titanium white was the only white acrylic paint. It turns out that there are several different types of white, and they all have different qualities. Having at least two different whites on your palette can open up a lot of possibilities. Titanium white is the most common and is sold by every acrylic paint manufacturer, as far as I know. Titanium is combined with the acrylic polymer to create a white that is opaque, has an extremely strong tinting power and tends to have a cool tone. Using too much Titanium White can make a painting look "chalky". 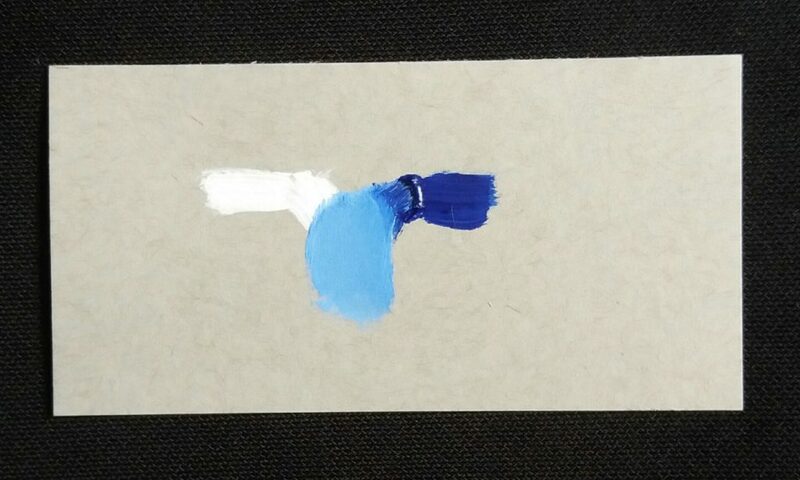 You can see in the example above that mixed half and half, the Titanium white tinted the Ultramarine blue by 50% and created a pastel. Zinc white is the first "other white" I came across and began using. It's sold by many acrylic manufacturers, but some brands, like Liquitex, call it "Mixing White." Adding Zinc to the acrylic polymer creates a white that is semi-transparent!!! If you've only used Titanium, then trying Zinc white will be a real treat. It has a low tinting power, about 1/10th that of Titanium, and tends to be neutral in tone. Zinc white works wonderfully with transparent pigments like the phthalos, quinacridones (my favorite!) and hansas, but will create subtle shifts in tone with any color. 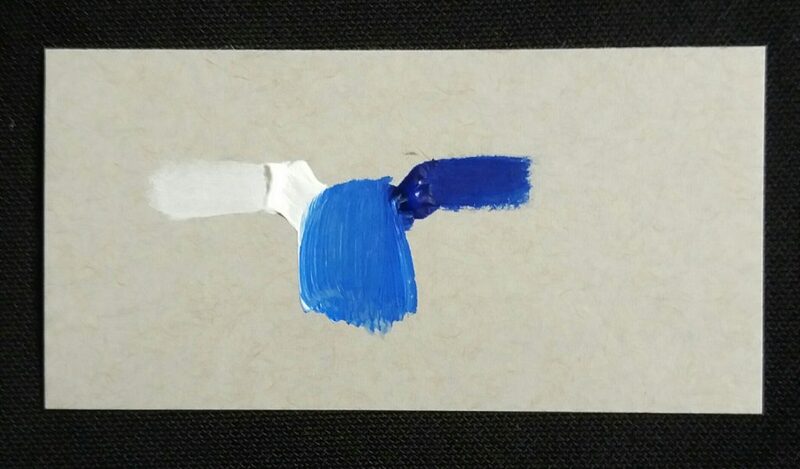 In the example, the Ultramarine blue definitely has a tint, but not to the degree of the Titanium and Ultramarine combination. There is also a purity of the hue that is maintained. Because of this translucent quality, Zinc white is especially useful when glazing. 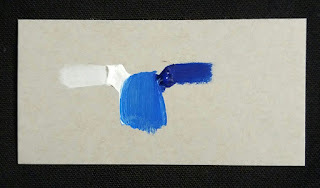 I recently began using Winsor & Newton professional series Mixing White which is a combination of Titanium and Zinc. It does seem to maintain the qualities of both. It is semi-transparent, has a medium tinting power and is neutral in tone. 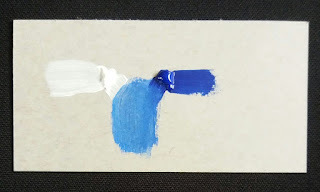 In the example the Ultramarine blue is tinted approximately 25-30% and has some transparency, but is not as clean as the combination with Zinc white. I think this truly is a happy medium between Titanium and Zinc, but I haven't used it enough yet to say for sure. Another white that I haven't tried is Flake (or Lead) white. It was commonly used by classical painters, but has fallen out of favor because of the toxicity of the Lead. The formulations found today still contain Lead, but typically in combination with Zinc making it less toxic. Flake white is opaque, has a low tinting power and has a warm tone. It also tends to dry faster than Titanium white. Chroma Atelier makes a Tinting White that seems similar to Flake white. It is a combination of Titanium white with Mica. According to the Chroma web site it is opaque, has low tinting power and a warm tone. I'm anxious to get a tube and try it out. The cat painting at the top of this post would look entirely different if the ears and mouth area had been painted with a warm white to coordinate with the warmth of the Cadmium red fur instead of Titanium white. There are countless options to choose from when creating a painting. Several different whites on your palette increases those possibilities even further. Having some knowledge of the characteristics may offer some guidance, but experimentation is the only way to know which white is right for you. Lisa Bohnwagner is an artist and writer with a love for creatures and a passion for creation (including herself!) - all of which can be found on her website:www.lisabohnwagner.com.